As someone who never ventures off road (with the exception of cross country that I’ve only done as my kid brother said “it’ll make you a better runner”) when the comment popped up on Facebook back in February I never thought I’d sign up for it. My only other experience of running a trail race was in Hamsterley Forest in 2013 and I’m still mentally scarred. Still, the thought of joining the team on a Saturday morning was too tempting and boom I’d signed up. The event then faded to the back of my mind with so many other races ran this year and bigger ones to follow, I found myself the week before thinking “oh sugar I’ve got a 10km on Saturday – how do I make this fit my current plan”. So with a bit of shuffling around things I decided to run the race then run a 12 mile route home. I was dropped off super early by the ever obliging husband only to be met by Mr & Mrs Knox, who were surprisingly bright for 8:30am on a Saturday morning. The rest of the team soon followed and by 9:15am we had a full complement of hoops. It was a well organised event, with plenty of portaloos, catering stands, metro radio dj and even a free bottle of Lucozade at the start. When the dj was shouting out the names of running clubs in his pre-race warm up but missing us out, Ria K then said “I’m sorry…we’re here” so off she went to tell him and we obliged with the war cry every time he then mentioned Saltwell. After a standard warm up and a quick round of the bean game, we made our way to the start pen. This was split into 10 minutes time zoned relying on athletes honestly to place themselves in the appropriate slot. More on this later. I started in the 50 – 60 minute slot with Sam Robertson. Everyone else was lined up in front of us but I knew I had another long journey ahead of me. 10:00am and boom we were off. It took a few minutes to get over the start but we soon settled into our stride. We made our way from the start, through the car park then onto the trail paths which were more like a gravel path than what I had envisaged. The route was really beautiful with a few exposed sections and one major incline but nothing to get upset about. After about a mile I spotted Phil Askew and thought “aye, I’ll catch you and see if you want a hand”. I caught up with Phil after overtaking runners that were walking already! Seriously people, why line up for a 10km if you can’t run a mile. Phil was running well and said he wanted his own head space so then went onto further “hoop hunting” (as it’s been known by other running clubs). 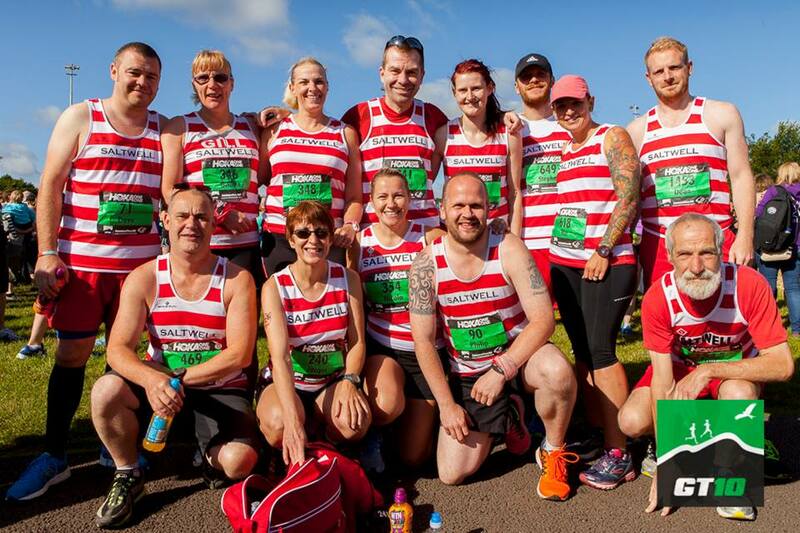 I caught up with a few, cheered on many aka gan on there Uncle Ian Billy’s on your tail, but found that running from the back and encouraging others was far more enjoyable than pushing out for a pb. I knew this wasn’t my race for that. The marshals’ were brilliant and really encouraging for the whole race not to mention a wonderful course. The course itself was through tree lined paths, across a field, under bridges and a two lap course. There is one incline and by the time I arrived there not a single runner was running up it. A quick puff of “helium” and that did the trick. 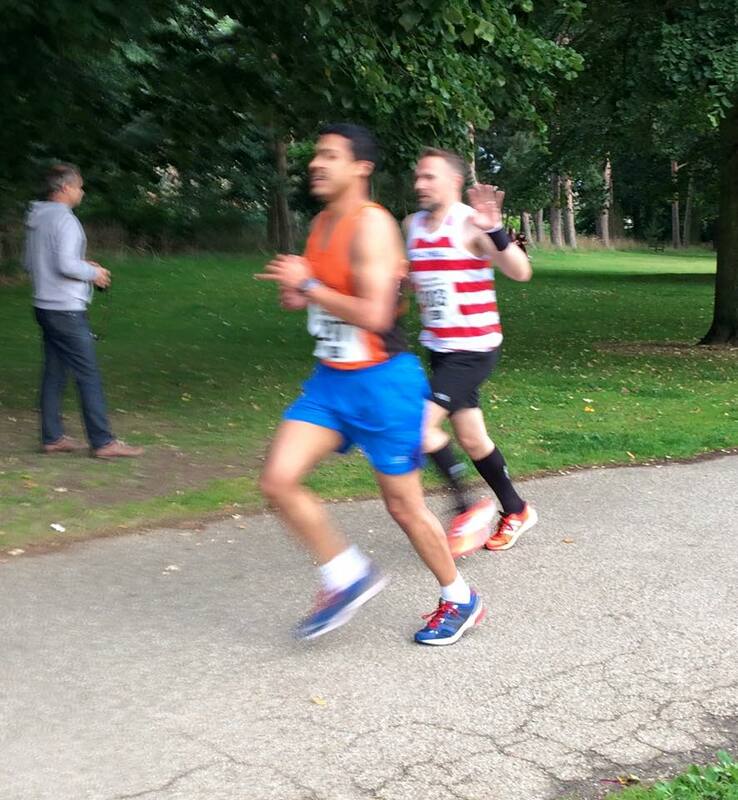 I may have been overtaken by some runners in the next 50 metres but I soon caught them. To be fair I normally navigate by pubs so trying to describe every kilometre of the course is a bit tough. By 8km I’d had enough and just wanted it over so went a little faster than I should but finished very comfortably in 55 minutes. Bang on plan! The dj who heard us shout “hoops” then shouted this every time he spotted a Saltwell runner. The goody bag was canny, a bag of crisps, bottle of water, medal, money off voucher and a banana with the option to buy a t-shirt. If this keeps race entry costs down I’m all for this. All in all a thoroughly enjoyable morning and I’d definitely recommend it to anyone wanting an intro into trail racing. It’s set me up nicely for the cross country mud that’s to follow. 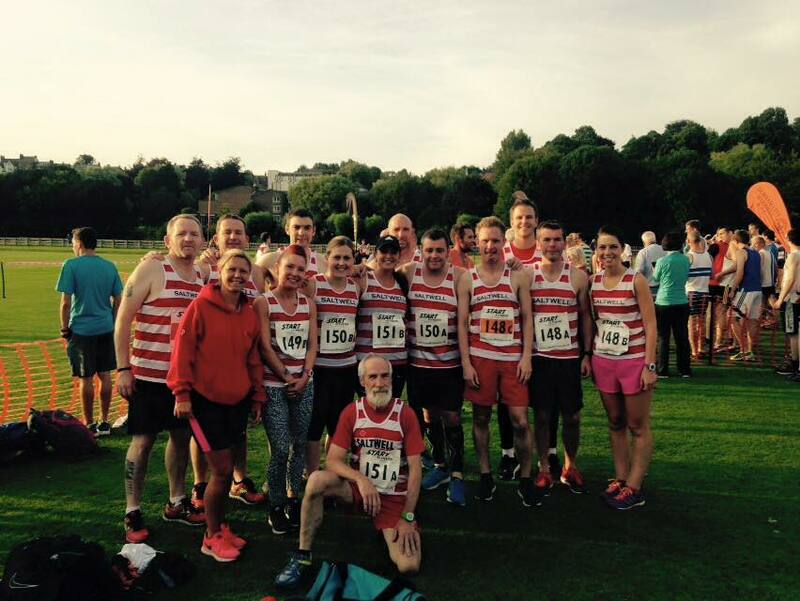 The Durham summer relays were held by Durham City Harriers on 20th August in a beautiful location on Durham riverside. We missed the deadline for entries as this is an event Saltwell don’t normally enter so myself and Ria Knox decided to try and get a few teams together after begging Durham City to let us put a late entry in. Rounding up the Hoops proved tricky being the middle of the summer holidays but we managed to find 12 keen runners to enter 4 mixed teams. The evening was a balmy summer evening, perhaps a little warm for my liking but the location was stunning on the banks of Durham riverside. We arrived with only 7 minutes to declare the teams so there was a frantic few moments picking teams and deciding who was running which leg which I had the task of sorting! Everyone has their preferred leg of a relay – mine personally is 2nd as you don’t get carried away with the fast lads if you run first but if you run the 3rd leg you normally end up running on your own with no pace setters. We watched the senior races and figured out the route – a 2 lap course in a figure of 8 including a lovely grassy bank – a few of us decided on a change of footwear and we were ready for battle. Dale, Sam, Dave and Fred were first to run. Dale as always showed an effortless performance. Sam clocked his fastest mile to date which I’ve no doubt Harra will take credit for. Dave’s super run can’t have been down to his brownies he made (he left them in the car!) and Fred as always made it look easy. All of the ladies took the 2nd legs with some fantastic efforts from all four. Speedy Kelly put in a great time and both Ria Knox and Sarah had great runs looking comfortable on the field. Ria K even stated she could have done more – something to aim for at next year’s event. Last up were Gary, Ian S, Scott and Andrew. Gary put in the performance of the night with an amazing finish and he picked off about 10 runners on his final lap. With a bad hamstring his run is a credit to him. Both Ian and Scott showed what the Vets can do with both looking strong and finishing in very credible times. Andrews’s first outing in a Hoops vest was a great one – well done on your debut! 33 mixed teams entered the relays and team A placed 5th, B placed 9th, C placed 18th and D placed 24th. If you haven’t ran a relay event before I can’t recommend them enough – it’s great to be out amongst other clubs and there’s a real buzz watching the fast pack come in over the line. I’ve been away in Suffolk for the last week and at the time of booking the holiday with the family, knowing I’d be missing a couple of races back home, I searched for something in Suffolk to keep me going! I registered to run the last of the Ipswich Summer Series – a set of 5k events run across the Summer. Events have also been organised in the nearby seaside town of Clacton. 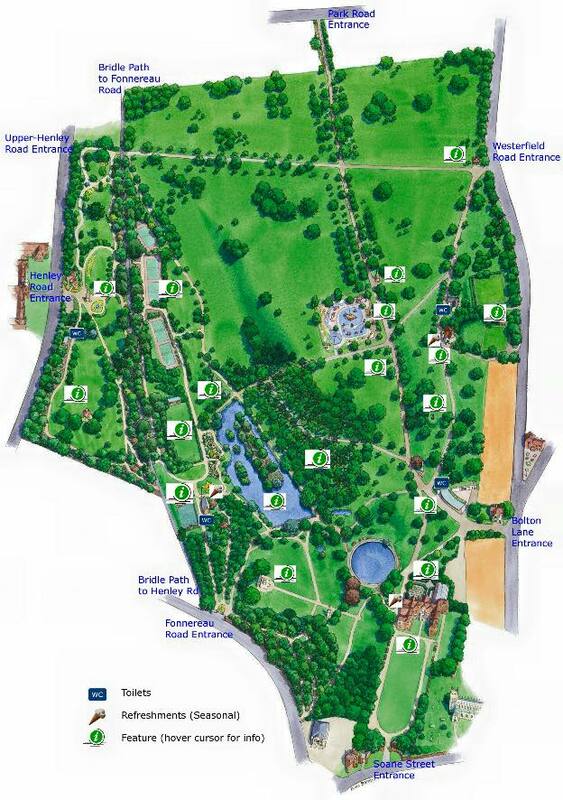 I’d never been to Ipswich before, let alone the park in which the race was set: Christchurch Park. On arrival people were beginning to gather and from a general look around there were clearly going to be some fast runners. 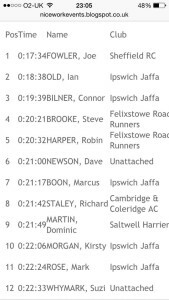 There were a number of clubs represented, with the main groups from Felixstowe Road Runners and Ipswich Jaffa. 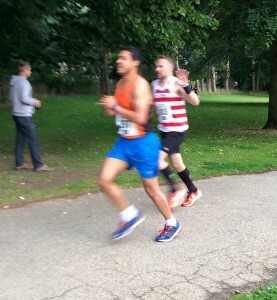 A guy from Sheffield in particular looked like he’d be the pace setter and the one to beat over the 5k. Not that I was thinking in any way that I was likely to win, my PB at 5k – run on the Riverside Park Run circuit – was 21.37. My key focus was trying to sustain my pace more evenly, I tend to run a 6.2 to 6.4 first mile on a 5k and then falter somewhat! I was also aware that the course was described as ‘undulating’ so wanted to keep enough in reserve for the hill sections. At 7pm we were counted down and then off. The initial section was a flat stretch of about a quarter of a mile. As expected the guy from Sheffield flew off with a group of 6 of us in pursuit. I fell in alongside a couple of others at what felt like a decent and comfortable place. The remainder of the first mile was relatively flat with the odd up and down, slowing quickly to navigate around the features of this Victorian park. I was really happy with the first mile 6.21 minutes and feeling strong. Then alas came the climb at 2k towards the end of a first lap of two. With Keith’s voice ringing in my head I increased the frequency of my steps and reduced my stride length. The hill was a steep and continuous climb. My pace was ok but my breathing became more erratic effecting my rhythm. A flat completed the first lap. As I ran through the start / finish line the marshal shouted out ‘just over 10 minutes’. I was delighted with this but the climb had just knocked the wind out of me. Not quite sure why but I was beginning to struggle and knew the climb was coming again at the end of the race. Slowing somewhat, I was passed and moved into 8th place. My split for the next mile showed the drop in pace 7.17 minutes. Struggling through the next km I began to recover my breath and prepare for the final climb up again to the finish line. As we zig zagged around the bottom end of the course along a boardwalk I was passed again but decided to let them go as I was aware of another runner approaching me quickly from behind. I was determined to hold the distance between us, but she was pushing hard. The final climb at the end of the lap arrived. I felt rather sick at the top but pushed on for the finish and managed a sprint to the line: 21.49 minutes and 9th place. Clearly, I’ve still got lessons to learn over pacing as my mile splits show: 6.21 mins, 7.17 mins and 7.33. The woes of a novice racer! I also need to work on adjusting to climb with the change in breathing and then recovery. I’ve got the stamina, but it just needs balancing and I guess that will come with experience and advice and support from you all. 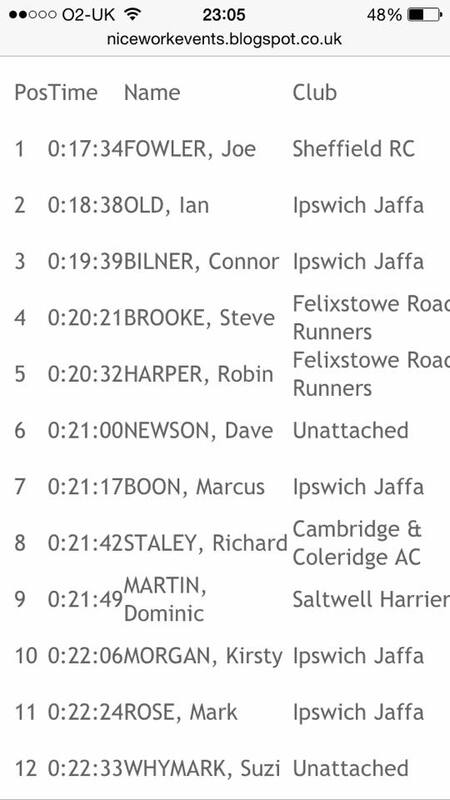 I am after all, at 8 months in, still relatively new to this running lark and very much a race novice. 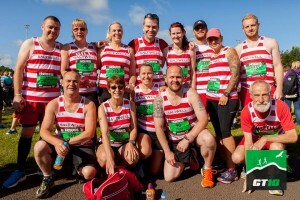 Most of all it was great to represent the club and I have a genuine sense of pride each time I pull on the vest; hearing the imaginary words of encouragement from fellow hoops!